What is ZO Restoracalm Soothing Recovery Crème? ZO Restoracalm Soothing Recovery Creme is formulated for all skin types to quickly calm red and irritated skin by stimulating and restoring the natural skin barrier. 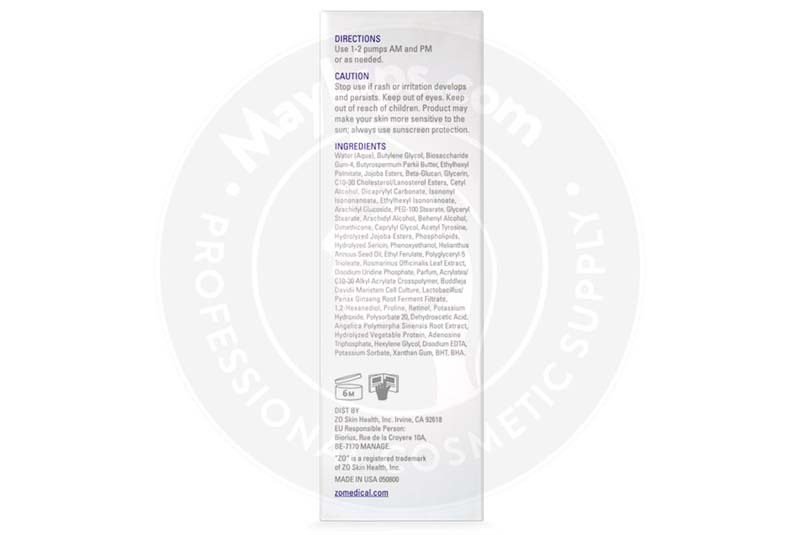 This skin cream, which has a pH of approximately 6.4, is created by ZO Skin Health Inc. as part of their ZO Medical line and comes in a 50mL/1.7 fl. oz. pump dispenser bottle. Please keep this skincare product at room temperature away from children and direct sunlight. This is only intended for external use. Other Ingredients include: butylene glycol, jojoba esters, dicaprylyl carbonate, arachidyl glucoside, dimethicone, phospholipids, helianthus annuus seed oil, rosmarinus officinalis leaf extract, potassium hydroxide, angelica polymorpha sinensis root extract, hexylene glycol, disodium EDTA, potassium sorbate. Refer to the product leaflet for a full list of ingredients. ZO Restoracalm Soothing Recovery Creme is used to calm and relieve irritated skin by stimulating and restoring the natural skin barrier. Dry, flaky, and weakened skin is soothed rapidly after application of the cream. The skin is the largest organ in the body, and prevents penetration by external aggressors like microbes and chemicals. Under microscopic observation, the outer part of the epidermis—the stratum corneum or horny layer—is made of dead skin cells bound together by epidermal lipids. This layer is then covered by a protective layer that is an emulsion of water and lipids known as the hydrolipid film. The protective barrier layer maintains the skin at its slightly acidic pH environment and helps to prevent the penetration of pathogens. Skin inflammation and infection occurs when the protective barrier layer is compromised. Constant exposure to harsh stimuli like chemicals, extreme changes in temperature and climate, and even washing with water that is too hot, can break down the barrier layer. When this occurs, the skin loses its moisture and becomes dry. The skin can also be easily inflamed in these circumstances, as inflammatory cells migrate to the areas where the barrier layer has been damaged to try and repair them, making the skin red and sensitive. ZPRO™: This is a proprietary technology that combines antioxidant and protein extracts from buddleja plant stem cells and hydrolysed sericin, respectively. The plant is also known as summer lilac or butterfly bush, and its stem cells are rich in antioxidants, while hydrolysed sericin is packed with amino acids. The combined actions of these agents enhance collagen and hyaluronic acid production. With this combination, any existing inflammations are efficiently repaired and the likelihood of future injuries is lessened. Beta glucan: Beta glucans are naturally occurring polysaccharides with skin repairing benefits. This ingredient promotes healing and rapidly reduces skin redness. Red ginseng extract: This ingredient is vital for promoting skin renewal and growth at a cellular level. New and healthy skin is constantly produced. Retinol: This is a type of vitamin A with strong antioxidant properties. It is renowned for helping skin regenerate new cells and diminishes fine lines. Scars are greatly improved and new skin health is preserved. Advise your patients to apply one to two pumps of this soothing cream onto cleansed and dried skin every morning and evening, or as required. Massage gently to ensure optimal product absorption. Patients can also mix equal parts of ZO Medical Retamax Active Vitamin A Micro Emulsion or ZO Medical Brightenex to calm future skin inflammations. Patients can also apply ZO Ossential Advanced Radical Night Repair after applying the soothing cream. ZO Restoracalm Soothing Recovery Creme is a skincare product made using medical-grade ingredients and is expertly formulated by world-renowned dermatologist Dr. Zein Obegi, so patients can be assured of this product’s safety. However, use during pregnancy or while breastfeeding has not been tested. Additionally, if your patients are allergic to any of the ingredients in this product, they should refrain from using this cream. Refer to product manual for more details on warnings, precautions, and contraindications. Most patients are able to apply this calming cream without any severe side effects. That being said, some of your clients might still develop mild side effects like skin irritation, increased sun sensitivity, or rashes after using this product. If they do display any of the symptoms, they should stop using the cream. Patients must also limit their exposure to the sun, use good quality sunscreen, and wear protective clothing when in the sun. Refer to product manual for more details on side effects. ZO Restoracalm Soothing Recovery Creme is formulated for all skin types to quickly calm irritated skin by stimulating and restoring the natural skin barrier. Its main active ingredients are buddleja plant stem cells, hydrolysed serecin, beta-glucan, retinol, and red ginseng extract, which all help to quickly repair and hydrate sensitive and weakened skin. Name: ZO® RESTORACALM™ SOOTHING RECOVERY CREME. Ingredients: Water (Aqua), Butylene Glycol, Biosaccharide Gum-4, Butyrospermum Parkii Butter, Ethylhexyl Palmitate, Jojoba Esters, Beta-Glucan, Glycerin, C10-30 Cholesterol/Lanosterol Esters, Cetyl Alcohol, Dicaprylyl Carbonate, Isononyl Isononanoate, Ethylhexyl Isononanoate, Arachidyl Glucoside, PEG-100 Stearate, Glyceryl Stearate, Arachidyl Alcohol, Behenyl Alcohol, Dimethicone, Caprylyl Glycol, Acetyl Tyrosine, Hydrolyzed Jojoba Esters, Phospholipids, Hydrolyzed Sericin, Phenoxyethanol, Helianthus Annuus Seed Oil, Ethyl Ferulate, Polyglyceryl-5 Trioleate, Rosmarinus Officinalis Leaf Extract, Disodium Uridine Phosphate, Parfum, Acrylates/ C10-30 Alkyl Acrylate Crosspolymer, Buddleja Davidii Meristem Cell Culture, Lactobacillus/ Panax Ginseng Root Ferment Filtrate, 1,2-Hexanediol, Proline, Retinol, Potassium Hydroxide, Polysorbate 20, Dehydroacetic Acid, Angelica Polymorpha Sinensis Root Extract, Hydrolyzed Vegetable Protein, Adenosine Triphosphate, Hexylene Glycol, Disodium EDTA, Potassium Sorbate, Xanthan Gum, BHT, BHA. Size: Pump bottle, 50 ml (1.7 fl oz).